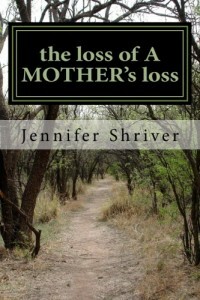 “the loss of A MOTHER’s loss” is a young girl’s journey growing up on a different page then her mother. All Jennifer wanted was to fit in but every step along the way, her mom made sure she didn’t. Finally out of the house, Jennifer and her mother hadn’t spoken more than a couple of times in ten years. When the phone rings with news her mom has passed, she doesn’t even know what to think anymore. As Jennifer flies back home, to all the people her mom was still close to, to her sister who has never wanted anything to do with her, she doesn’t know what to expect. Each day she’s there, she flashes back to another event in her life that led her and her mother to where they were. Not speaking. And now she lost her chance to reconcile, now there is no good bye. The passing of my mother was the inspiration behind this book. Her and I had a very rocky relationship to the point we had eventually just stopped speaking to each other. Our estrangement led to my separation from everything and everyone I had known growing up. When I got the call from my sister that she had passed, I was not even sure how to feel. When I went back home, it was, nothing felt right with anyone anymore. So this book is our story, the story of my mom and I and how we got to where we were. It was something that, when she passed and I went home and dealt with the coldness of the people that knew her that ensued, I needed to get out and let everyone know the real story. When I was done sleeping in the airport, I went to the bathroom to change and freshen up. My genius self, when I was finished, left my wallet in the bathroom. After I left the bathroom, I had made the decision to go to California. When I went to grab my wallet and realized what had happened, I had only one option left. I had just enough cash left on me for one flight. I made the decision that meant I was supposed to go home. I bought a ticket back to Chicago. It is still completely beyond me but I have absolutely no recollection of the actual flight this time either. Neither there nor back can I recall a single moment on the plane, not getting on or getting off. All the details surrounding it, from sleeping in the airports to what happened when I left the airports, I remember pretty well but I cannot find the memories of being on the planes. When I got to Chicago, it was very late that night. I tried to sleep there as well but apparently they do not let arriving passengers hang out like that. Only the people departing, at least before they actually purchase their ticket and go through security. So, I started walking, from O’Hare Airport in Chicago in the middle of the night by myself in March. It was dark. It was cold. I had no idea where I was going. I had no money. I had no food. So I walked. I walked for about an hour, I was walking on the shoulder of the freeway at this point, when a cab driver saw me and pulled over. I told him I did not know where I was going and I had no money so not to worry about it. But, again, a complete stranger actually cared enough to not let that be that. He offered to take me somewhere, anywhere and I told him my story so he would understand I really did not know what I was doing. He said I could stay with him for the night and then try to figure it out in the morning. I accepted. He had three roommates, two other guys and one of their girlfriends. The guys were foreign so I could not really understand them well but the girl was American and was very sweet to me. I hung out with her in the city for the day. Again, I was fed and taken care of. I did not want to go home at all. I was really enjoying finding all the good in the world. No matter how uncomfortable I was with strangers in completely being myself, I saw that there actually were good people in the world that did good things just because they saw a need for it.